The cole crops are made for the cold season gardener. Thankfully we like them, particularly broccoli and brussels sprouts. 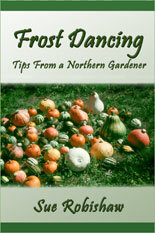 They can be easy to grow and they don't mind frosts -- my kind of garden crop! BRUSSELS SPROUTS -- Plant some extra Brussels Sprouts in the garden and in late fall before hard winter sets in dig up several plants and 'transplant' them into 5 gal buckets. Just loosen the roots with a fork, pull up and put them in the pail. Fill over the roots with damp sand. Set them in a cool but not freezing cellar or similar place and you can harvest "fresh" sprouts long after the garden Brussels are frozen solid. Keep the sand damp but not soggy. After many, many years of dedication and contentment with the venerable open pollinated DeCicco Broccoli, I've discovered a new love. Not that there is anything wrong with DeCicco; it's a very good variety--reliable and it continues to set many smaller heads/shoots after the main one is harvested. But this year I discovered Piracicaba (from Fedco Seeds). It's a little earlier than DeCicco, is larger, and is healthy and productive. But its main joy, for me, is its loose heads, which makes it easy to spot cabbage worms -- both for me and the birds (though I find that the birds seldom miss any). 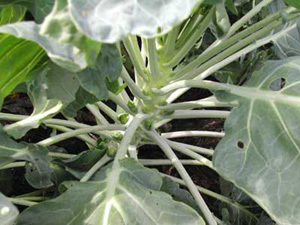 It continues to produce after frosts, and even after it flowers and starts setting seed. Which, unfortunately for this seed saver, takes a fairly long growing season to mature so my seed crop is sparse. I keep trying though, in case it is dropped by Fedco. Good flavor, too, and holds up well after many freezes. I'd hate to lose it. I keep looking for a good, open pollinated Brussels Sprouts and I think I've found one in Roodnorf. It did a bit better for me than Groninger, which I also like. The purple Falstaff, though pretty, seldom makes it past the "cute small sprouts" stage, even when planted earlier. It also doesn't hold up to freezing very well, so guess I'll stick with the green ones. We don't start eating the Brussels Sprouts till after the frosts and freezes have set in and the Broccoli is gone or too whimpy from being frozen, usually in November/December. I guess you could call it "fresh frozen" food. The sprouts are easier to snap off when frozen, too, the tiny cabbages just pop right off. It was interesting, in a rather disconcerting and could be worrisome way if I was apt to give in to worrying (which I avoid) that this summer (2008) we had a marked decrease in birds around the homestead, and in the garden. It is probably just the usual, and natural, trend as the number had been increasing to a pretty good crowd. But fewer birds meant a little less joy and a lot more cabbage worms. I've always appreciated greatly the birds' contribution to the success, and ease, in my garden but even more so when they weren't there. The Chipping Sparrows that did come back, and the others, did a great job as they could but I certainly had more worm damage than I'd had in years. The interesting thing was, though, that we had no less of a crop. Though I didn't do anything special. The Brussels Sprouts leaves sure wouldn't have made it onto the cover of any gardening magazine, yet I harvested the usual small basket of little heads from each plant. Maybe there were more nibbles in the sprouts than usual, but nothing serious. And I had to pick off a few more worms from the Broccoli, which didn't affect our enjoyment of the many, many meals we were provided. And they went on to provide a generous array of yellow flowers for late harvest by the many bees. I found that a few more holes in the leaves didn't seem to bother anyone, including the plants. I don't do much with flowers in my garden, but for years I've grown Glads or Lavatera (what a riot these outrageously pink flowers are!) 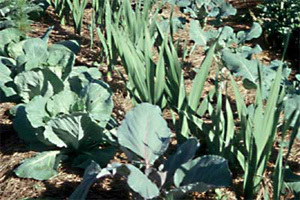 down the center of my Cole bed, with a row of Broccoli and/or Brussels Sprouts on either side. They do well together and are a bright spot in the garden. BROCCOLI did well this year in spite of the hot, hot July and August. At least those that made it past the cutworms (note -- use TALL cardboard collars! These guys simply stood on end and ate the stems off above my regular collars). And the root maggots. I hadn’t had that problem for many years and had gotten quite lax about putting wood ashes around the roots when transplanting, and around the plants thereafter. So, another note -- use wood ashes! It isn’t as if it’s even that much of a job. But, how easily we forget past problems. 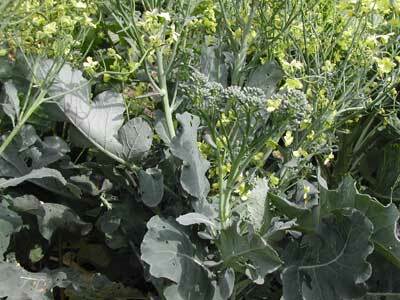 As might be expected, the BROCCOLI was so-so in the heat, being a cooler weather lover. Though May was cold and wet, it warmed up in June so things grew well. Then, after a couple of light frosts the first of July, it turned hot and humid into August. But in spite of the weather challenges, the garden provided us with good food. The CABBAGE grew fine and fast, and split fast. The Marner Allfroh was the worst and much of it ended up in the compost pile. Primo not only had smaller heads (which suits us better) but split less. Red Drumhead had little trouble with splitting, with nice small heads as well. The cabbage worms and loopers loved the weather. I haven’t had that much worm damage in years. Interesting though, I seldom saw the worms. But the birds were constantly in the patch (particularly the wonderful Chipping Sparrows). They got my thanks often, though I know that is not their reason for being there! To discourage the worms, I tried sage leaves strewn over the plants, but that didn’t seem to have any affect. Then I tried flour dusted on in the morning dew. That did seem to help, but was a bit of a mess. The birds were definitely tops for worm control.